Home News and Updates Breaking News! Boxer & Rice Re-launches site! 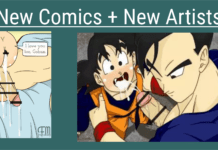 Boxer & Rice started back February 11th 2001, and is widely known in the DBZ gay community. Over the years they’ve collected and 100s of exclusive fanfiction and artwork. Every thing one their website is accessible for free without any membership, though spreading the word about their re-launch is appreciated. If you repost/reblog anything from their site to like Tumblr, make sure to give a source backlink to their page. 😉 Same for anything you’d do anywhere else. It’s just the right thing to do. So go check out the new site! Make sure to comment and share their website on your social media accounts like Tumblr, Twitter, and Facebook!